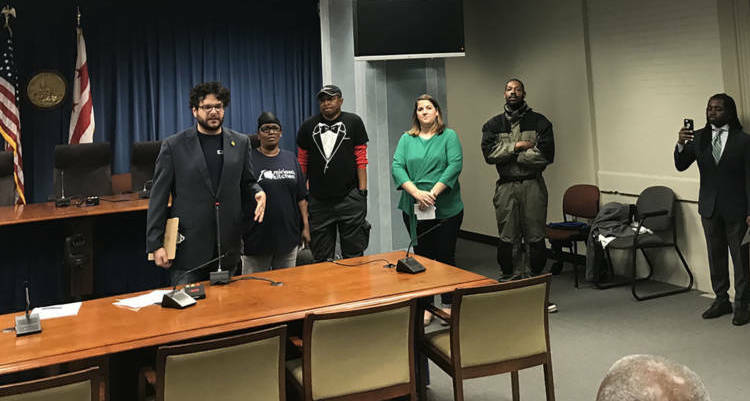 Mayor Muriel Bowser’s budget proposal for homeless services only meets one-fourth of the overall need, advocates told D.C. councilmembers during an April 25 briefing at the Wilson Building. Representatives from Wards 1, 6 and 8 were present, along with three of four at-large councilmembers. Jesse Rabinowitz, an advocacy specialist at Miriam’s Kitchen, began the meeting by stating that the District has the available resources to end chronic homelessness — defined as when an individual is continuously homeless for one year or more or has experienced multiple episodes of homelessness — but that more funding is necessary than what has been allotted in the FY2019 budget. The Way Home Campaign’s proposed budget investments garnered support from organizations such as the Coalition for Nonprofit Housing and Economic Development, the Fair Budget Coalition, the D.C. Fiscal Policy Institute and So Others Might Eat. The campaign recommended an investment of $7.1 million for 400 units in the Target Affordable Housing program. The mayor’s budget proposal provided for $1.3 million, or 70 units, for the program, which supplies long-term affordable housing for individuals who no longer need the supportive services that permanent supportive housing provides, or for whom rapid re-housing isn’t a good fit. According to the Way Home Campaign, that investment would only meet 18 percent of the total need for targeted affordable housing. The campaign also recommended that the District government allocate $19.6 million for 820 units of permanent supportive housing, which involves subsidizing rent and providing supportive services such as mental health care for those who need it. Bowser’s budget proposal allocates $13.6 million for PSH, or 250 units, which is an increase from previous years but, according to the campaign, meets just 30 percent of total housing needed in that area. Adding more PSH would be cost effective, Friendship Place program director Keri Thomas said, because putting people into permanent housing will decrease reliance on hospital visits, crisis intervention services, and shelters. “We know permanent supportive housing works,” Thomas told the councilmembers. Waldon Adams, a formerly homeless District resident and member of the Way Home Campaign steering committee, was one of the first individuals to be housed under PSH through Friendship Place 10 years ago. During Waldon’s first year in permanent housing, he not only got sober after an almost lifelong battle with drug addiction, but also ran a marathon. “I cost you all a lot of money,” Waldon said of his life before being housed, when he spent “a majority of [his] life” in hospitals. Being placed in permanent supportive housing “saved my life,” he said. Reginald Black, a “consumer representative” nominated to be an official voice for the homeless community on the D.C. Interagency Council on Homelessness, called on councilmembers to prioritize investing in supportive services for homeless individuals along with improving shelters. Black, who is also a Street Sense Media vendor, said shelters are built to save lives but do not provide avenues for shelter stayers to get back on their feet through employment, housing or medical services. At-Large Councilmember Robert White said he has seen almost the entirety of his family priced out of the District as the cost of living continues to increase. “One of my frustrations in this city is I don’t think we put enough of an emphasis or priority on affordable housing,” White said. He called on the council to challenge developers building in D.C. to increase the amount of affordable housing they include as well as to put an emphasis on building family-sized housing. As Street Sense Media reported in the previous edition, the Mayor’s budget proposal has also received criticism from the D.C. Fiscal Policy Institute and the Washington Legal Clinic for the Homeless. Both organizations knocked the budget’s lack of assistance for D.C.’s lowest income residents as well as its $6.6 million allocation to rapid rehousing—the largest housing enhancement included in the budget. Rapid rehousing has been widely criticized for placing families in leases they cannot afford, resulting in their eviction once government subsidies end. At-Large Councilmember Elissa Silverman closed out Wednesday’s budget briefing by saying that the allocation of District resources is flawed. “We put a lot of resources into things that don’t work,” she said. Silverman argued that more resources need to be put into the programs that are known to work, such as Housing First, permanent supportive housing, and targeted affordable housing. The council will hold its first vote on the fiscal year 2019 budget on May 15. This article has been updated to reflect that Mayor Bowser’s budget proposal only included enough funding for 250 units of permanent supportive housing. The article initially stated the proposal provided for 570 units of PSH. However, that is the number of additional units the Way Home Campaign said should be funded in order to meet the 820 units of PSH the campaign estimates are needed to end chronic homelessness.